You could say that the annual Community Concert at Salinas’ Alisal Center for the Fine Arts isn’t merely a concert. It’s an event that brings everyone together — young and old, Anglo and Latino, professionals and students — in a way that resonates with those who attend. For ACFA program director Javier Tamayo, there are echoes of village festivals in southern Mexico, where musicians, poets and dancers come together for fandangos that last all night and into the next day. The free concert this Saturday, Oct. 6, at 6:30 p.m. combines the talents of young musicians, dancers and others who will perform with the local nonprofit orchestra Monterey County Pops! There will be a special emphasis on son jarocho, a folk music style native to Veracruz, fusing indigenous, Spanish and African influences. Tamayo frequently travels to different areas of Mexico for in-depth studies of its regional music. “They assimilate here, but still value where they came from,” said Tamayo. 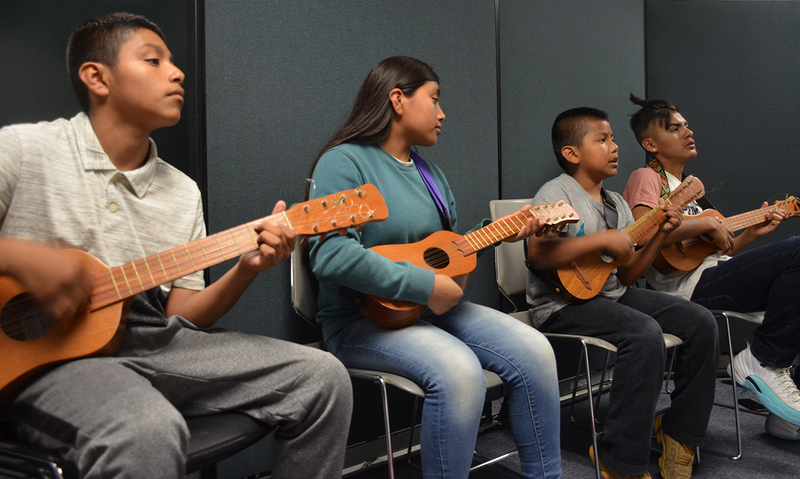 Performing on Saturday will be a variety of ACFA student groups, including the guitar ensemble Rondalla de Alisal, and ensembles Taller de Son Jarocho y Fandango and Baile Folklórico Alma y Tradición. Highlighting the event is the newly formed Mariachi Juvenil Alisal of Alisal Union School District. The concert, now in its third year, is also an opportunity for student musicians to bond with professional players. Monterey County Pops! conductor Carl Christensen, a longtime music educator who retired from Hartnell College, selects musicians from Monterey, Santa Cruz and Santa Clara counties who play alongside the youngsters. In addition to traditional American selections such as “Bill Bailey” and “Basin Street Blues,” the musicians will perform Mexican favorites “La Llorona,” “Cielito Lindo,” and “Canción Mixteca,” as well as regional music, including “Jarabe Tapatio” from Jalisco and “Sones de Pinotepa Nacional” from Oaxaca. The program will conclude with themes from popular movies and marches by John Philip Sousa and various Mexican and Spanish composers. Christensen also has a deep connection to Mexico. He lived and worked in Mexico in the 1970s, as principal trombonist with the Mexico City Philharmonic and other orchestras, taught trombone at the Mexico City Conservatory of Music, and is bilingual. He admires Tamayo’s efforts in bringing back regional music, noting that every area in Mexico has distinct musical styles. Traditional instruments like the jarana, a type of small guitar, and the tarima, a wooden platform, will be used at Saturday’s concert. The tarima is particularly interesting, Tamayo said, because while musicians are playing, they are also providing additional percussion by stomping on top of the platform, which is both instrument and stage. Not only is Monterey County Pops! dedicated to bringing popular and patriotic music to the public for free, but also to engage and educate underserved youth of Monterey County. To that end, the orchestra often performs for communities in south Monterey County, including Greenfield and King City. 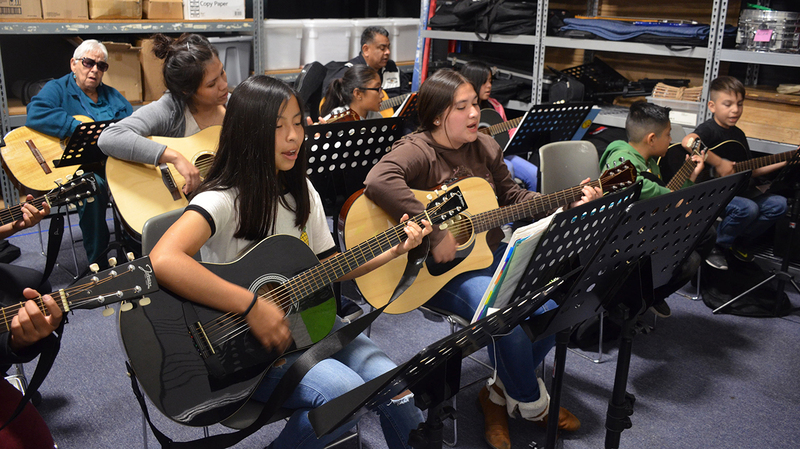 ACFA, which offers free fine arts instruction in traditional Aztec dance, visual arts, Latin percussion, guitar and community theater for ages 8 to 18, is an ideal partner for Monterey County Pops! mission. Amazingly, the students and Monterey County Pops! musicians only rehearse together once, right before the concert. But those hours of mentorship are particularly meaningful, Tamayo said. “The kids really like it,” he said. “It’s not every day that they get to work with professional musicians. They benefit from being able to see their musicianship and professionalism. And the audience is just as appreciative. Christensen recalls how observers at a recent performance at Greenfield Middle School “held their phones up (to record) throughout the entire concert.” Tamayo said between 150 to 200 people typically attend the ACFA concerts, excited to see their children play music with real musicians. Someday, Tamayo said, he hopes to organize an authentic fandango in Salinas, just like the ones that are held in the villages of southern Mexico. “It’s a way to build community,” he said.